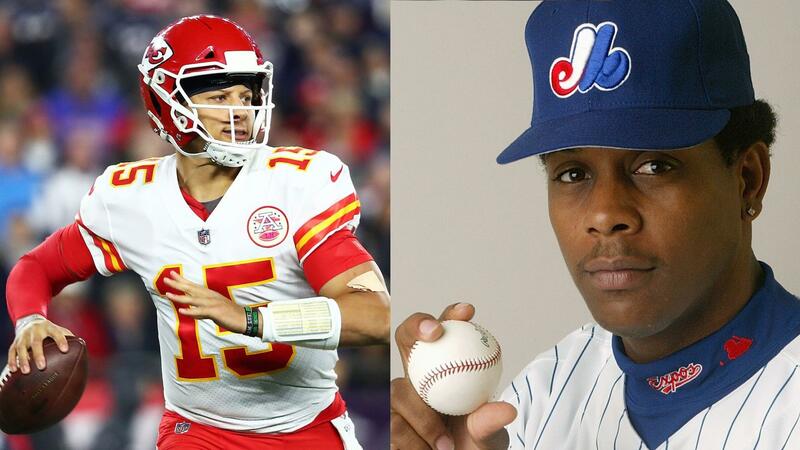 I say I say I say… did you know Pat Mahomes’ dad played professional baseball? Yeah! It’s true… Wait, whats that? You do know? You must of caught one of the 2,467 mentions it got on an NFL broadcast this season (Cris Collinsworth was responsible for half of those). Now personally, at the beginning of the year, I had never heard of Pat Mahomes Sr nor anything about his baseball career. Fast forward 18 weeks and one QB’s meteoric rise later, I now know that Pat Mahomes II is a pretty special quarterback and his father was the greatest thing to happen to baseball since anabolic steroids. On there, you find out he played for six teams, accumulated 42 illustrious wins and retired with a stellar 5.47 ERA. Not the stats I was expecting from a guy thats been built up as the reincarnation of the late great Mordecai “Three Finger” Brown. For God’s sake, Bret Saberhagen and his 3.34 ERA has been in the backyard making his kid practice RPOs now for six months straight… and he’s already 35 years old! “Just give me a little of that Pat Mahomes magic,” papa Saberhagen feverishly yells at his son as he eagerly attempts to flee. That kid/grown man needs a break and so do we! Now I’m not saying that I could do any better but hey… NFL… we got it. Pat Mahomes Sr played baseball. His son plays football. Can we focus on that, please?